We were booked out of Marsh Harbor to West Palm Beach on an 11:40 a.m. Silver Airways flight. So we took the first ferry, leaving Hopetown at 8 a.m. Just to be sure we wouldn’t be late. What a joke – on us! 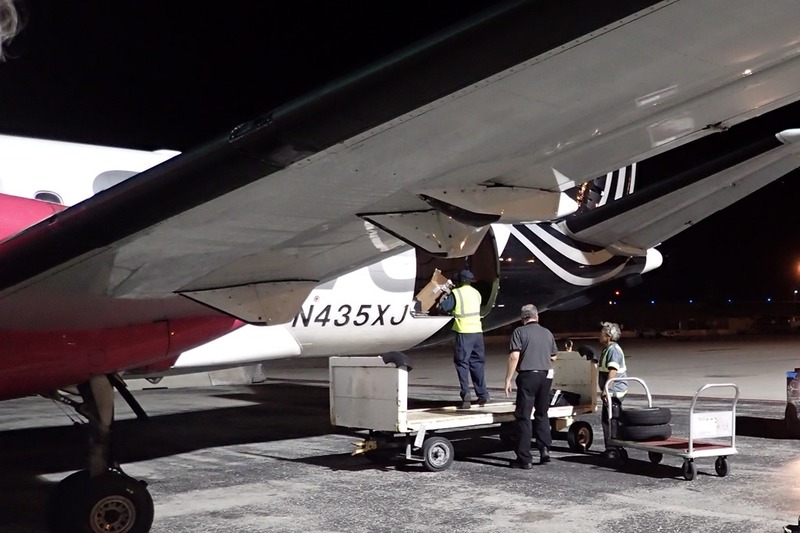 We got to PBI about 10:30 that night. 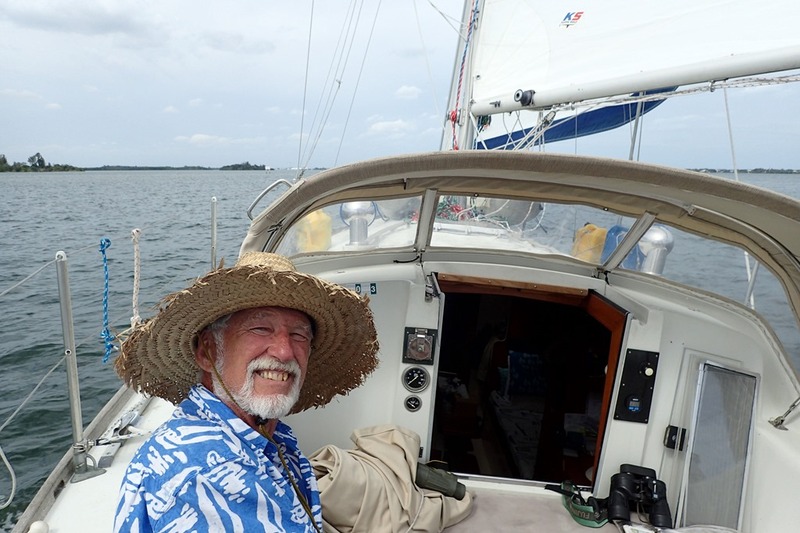 This blog post is not about sailing; it is, in my opinion, a public service announcement. First, the plane was delayed – until 1:05 p.m. No explanation given. We hadn’t eaten before we left Hopetown, so we had sandwiches from the concession in the waiting area. This is the only place to get food in or around the airport. 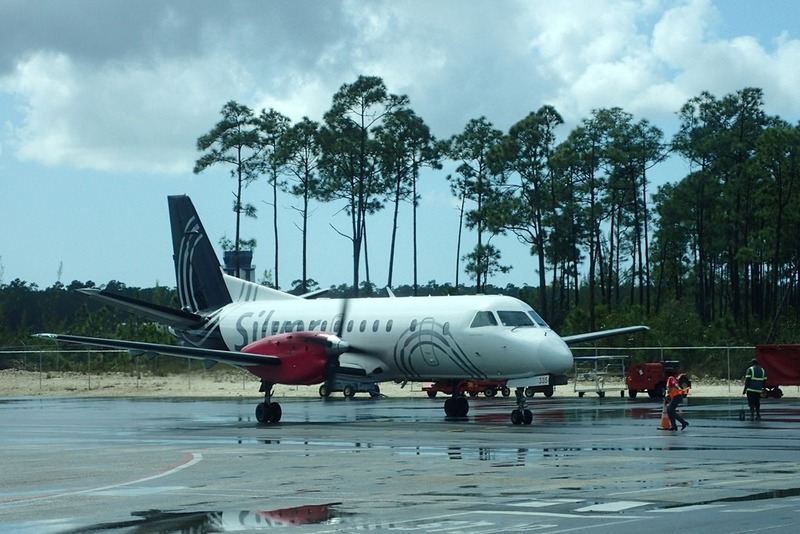 Finally, at 1:14 p.m., an actual Silver Airways plane from PBI landed at the Marsh Harbor airport. And I, of little faith, had seriously doubted whether SA even had any planes. Its scheduled arrival time was 11:10 a.m. – it was two hours late. But why was it parked way over there instead of near the terminal? Oops, the plane had a FLAT TIRE. (I don’t know about you, but this was a new one for me.) 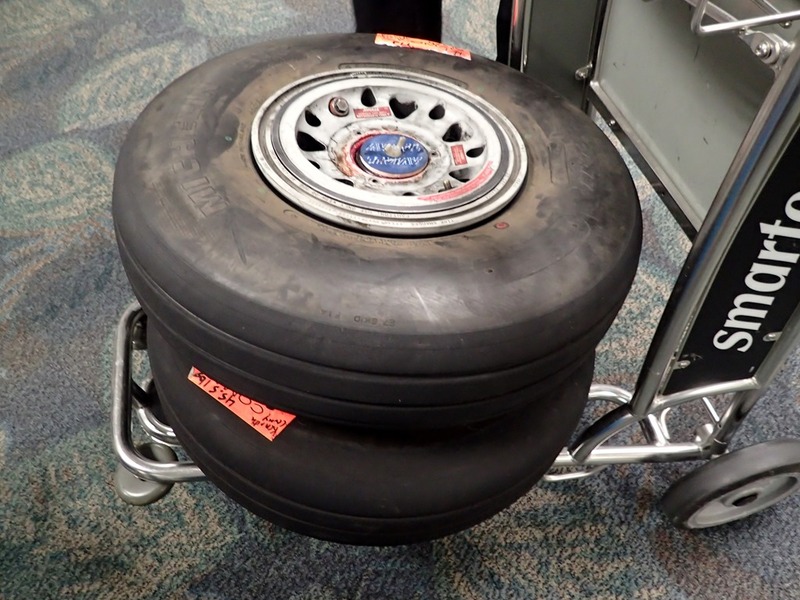 Silver would bring in new tires and a mechanic (none in MHH) from Ft. Lauderdale on the next flight, scheduled to leave FLL at 2:45 p.m. to arrive in MHH at 3:48 – we’d be on our way in no time. Just a little longer wait. Oops, oops, and oops. 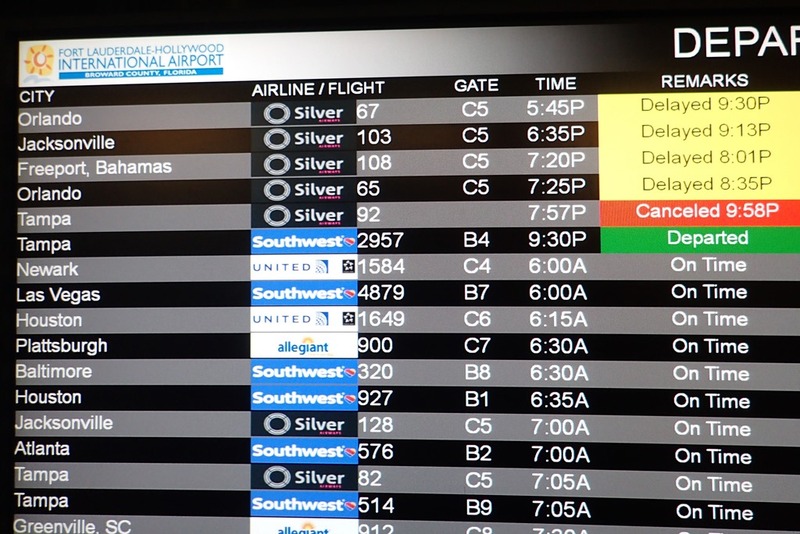 The flight from FLL didn’t leave until 4:10 so it arrived in MHH at 5:03 p.m. That meant that our flight crew would time out and the flight would be cancelled. But no, the flight crew from FLL and our crew from PBI could switch, which would give us a longer window to get our flight out. Great. The co-pilot said they must have run over something on the runway; the mechanic opined that they must have landed hard enough to blow the seals. Finally the station manager for Silver Airways (the entire ground crew were quite nice) announced that we’d be leaving in 30 minutes. Yeah!!! A little over 30 minutes later, we were told to line up and present our boarding passes. Yippee. We passed through the doors and assembled on the sidewalk outside for our walk to the plane – there are no jetways in MHH – even at the new terminal. Where we waited, and waited and waited. We had no idea why. Passengers started to get irritable and mouthy. A large security guard joined the group. After complaints that we were being eaten alive by bugs, we were all ushered inside. Now it was almost 7 p.m. It was announced that we could no longer arrive at PBI because the customs office there closed at 8pm. We would be diverted to Ft. Lauderdale and bused to PBI. We were too stunned to react. More waiting. By this time, we’d been at the airport ten hours. SA issued food vouchers, but there was no place to spend them – the concession had long ago run out of food. I had some of Vernon’s bread and we tore off big chunks and washed them down with water. 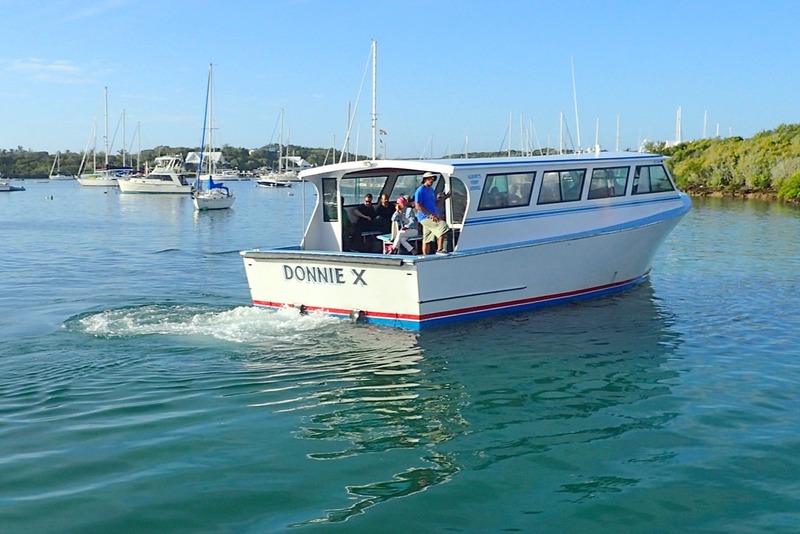 The last ferry had departed for Hopetown at 6 p.m. A man left for his home on Guana Cay, giving up on a 3 day trip to Albany and willing to hire a private boat to get back to Guana. A young couple returned to where their folks were staying to try again another day. Passengers were on phones trying to re-arrange schedules and some squeezed onto Bahamasair flights to Nassau and beyond. Now there seemed to be some problem with paperwork and codes and the gate crew were all on phones and filling out forms. We finally boarded – less than 20 of us now. And touched down in FLL – not our final destination – at 8:47 p.m.
By the time we found Terminal 1, there were only six of us left to be transported to PBI. The others, a family of four, had befriended a family from West Palm during their stay in Abaco and were going to spend the night with them. I was on the phone with our daughter who was searching for hotels – all booked or quite expensive. On the drive north, I finally connected with a car service that could pick us up at the airport when we got there. A Cadillac SUV took us to the boat, arriving just after midnight – so exhausted we were practically incoherent. Luckily the ladder was still next to the boat. By noon the next day, we were back in the water. And had a great sail up the Waterway. 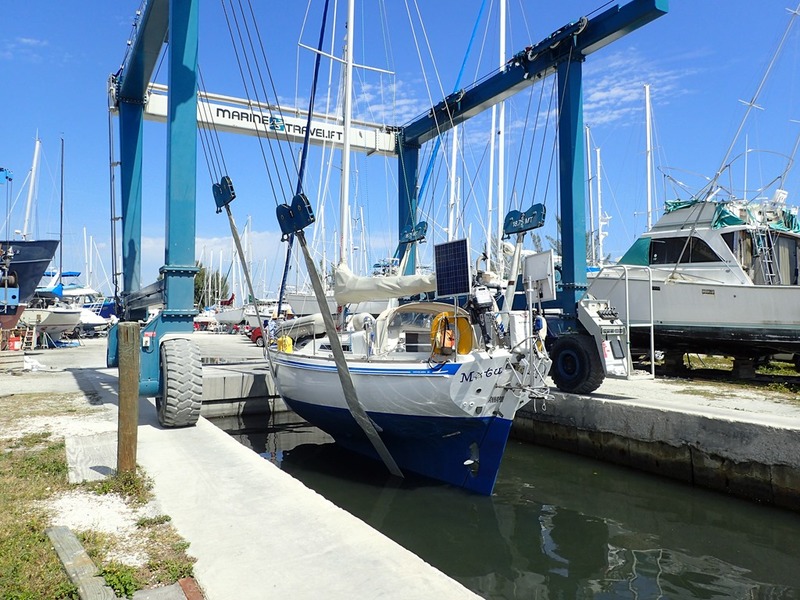 Back to the Vero Beach City Marina to re-provision, get the spare propane tank re-filled, do laundry, and watch the weather. But with sand in our shoes and the magic of Hopetown in our hearts – and a bit of luck – we’ll return to Abaco soon. Well this winter is full of adventure…. not quite what you planned, but memory making for sure! We’ll definitely put SA on our ‘no fly’ list! Sometime you will have to ask my brother, Larry, about his trip to Merida via Mexico City…..sounds similar! So Sorry! Terrible travel, too late to be up, no food. go, no wait; you had the worste of everything. At least you were both with the one you love. I hope all goes well now.